Dan Swinhoe (Asia)- Myanmar: Unpolished Gem or Fool's Gold? Despite Myanmar's checkered past, in the last 12 months the country has turned a corner. The release of the pro-democracy party leader Aung San Suu Kyi after nearly 20 years of house arrest, free elections and the easing of international sanctions on the country have seen the nation take a U-turn. As well as greater freedom and the hope of improving the lives of the people, companies around the world are seeing real potential for the country to become the next major emerging market. Companies such as Coca Cola and ad agency WPP are already starting to build a presence, and executives are flying out on a regular basis to scope out the landscape. One of the big areas opening up is IT. IDC recently released a report into the country's IT sector, calling its greenfield market an ‘Unpolished Gem. '"Myanmar is virtually one of the last untapped ICT markets in the Asia/Pacific region with fast rising potential. For IT spend alone, IDC is expecting 15% year-on-year growth in 2012, and the market is expected to reach US$268.45 million by 2016." That represents a massive annual growth rate of 14% over five years. IDC predicts Yangon and Mandalay will be the two leading IT hubs for foreign market-entry and IT consumption, with telecoms, government, utility and energy, financial services, hospitality, and media sectors all major areas for growth. The government has taken steps towards the future, with both a long-term plan looking to 2030 set up in 2005 and a more near-term one that addresses the plans for the next few years. These kind of goals help focus initiatives and funds, and with so much change on the table coming all at once, focus will definitely be needed. 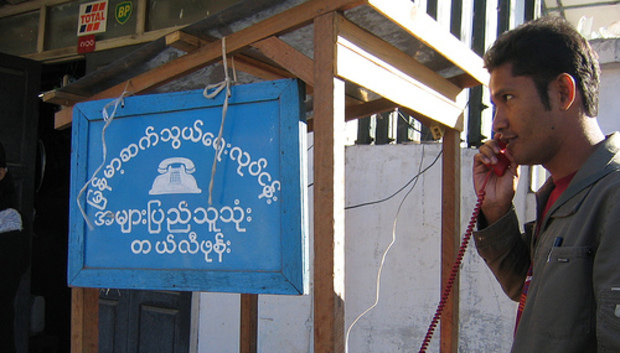 The telecoms area may be the first to take the leap, with Myanmar's Post & Telecommunications Department Director General, Khin Maung Thet, saying a new communications law is being studied to create four new telecommunications licenses in the country that are open to both local and foreign investors. Previously foreign investors were barred from holding a license. Despite the buzz and talk of potential, Myanmar has been an information blackspot for IT, and the information that is available is usually either outdated or comprised of sketchy estimates. Worldbank data shows there were around 100,000 internet users as of 2009, a number which had stayed level for the previous few years, while broadband is virtually non-existent. Mobile subscriptions stand at around 550,000, which equates to a penetration figure of around 1%. Socialbaker, a site providing regular Facebook figures, doesn't have any Myanmar figures, although as the things open up this is bound to change. According to StatCounter mobile access to the internet has risen sharply from practically nothing at the start of the year to just under 9%, with Android being the most popular user choice. For desktops, Windows is king, and web browser choice is split 50/50 between IE and Firefox. Piracy levels in the area remain murky, neighbors such as Vietnam have software piracy levels around 80%, meaning some companies, such as Microsoft, are nervy about entering the market. Introducing an IP system, trademark registry and corresponding intellectual property law may help to alleviate fears, but that in itself could bring more problems. These rapid changes could lead to a host of problems. The fast rate at which news bills are being passed could lead to poorly thought and inadequate legislation, which would only put off investors and cause trouble for people and companies on the ground. The government recognizes their lack of knowledge and expertise in many areas and have been recruiting help from neighbors such as Singapore and Japan, but other dangers remain. The country has a serious unemployment problem, and expanding too quickly into areas that require specialist skills will create a major skills shortage. Already vast amounts of people are unemployable for skilled work, many in general are unfamiliar with modern technology such as smartphones and desktop computers. Sustainable growth and education are essential to prevent future problems. By 2015 the government is hoping for 50% of the country to have wireless access. But with around 80% of the country's 60 million people living in rural areas, many of them in poverty, there are several issues that first need to be addressed; Fixing the chronic lack of decent infrastructure, including the rolling power cuts; Further relaxing internet censorship; and dealing general lack of familiarity with technology, and these are thing that won't happen overnight. To fulfill its potential, Myanmar has to move at the right pace and think things through, not charge ahead blindly.